Most likely you have enjoyed a good ice cream this summer, and it has probably occurred to you that everything seems to be getting more and more expensive over time as you stood there and looked at the ice cream prices. However, I want to show that you are wrong on that issue and argue that most things do not become more expensive over time. I want to talk about money in this fourth blog post in my series on anarcho-capitalism (here you can find part I, II and III) and tell you why today’s form of government-controlled money is bad and unfair, and what the alternatives are. I mentioned money in part III of this series, but the main point is that money is extremely important as a medium of exchange in barter. For individuals to feel satisfied after the barter is made, they must use a medium of exchange, i.e. usually money, that the individuals can rely on and which should not be possible to corrupt by third parties. So what does the monetary system look like today? I have made a graph of how the price on a popular swedish ice cream, called Piggelin, has changed in Swedish krona (SEK) and against gold since the ice cream was introduced to the Swedish market in 1972, and until 2010, to illustrate the current monetary system in the world (see Figure 1). What is shown is that the price of Piggelin has changed dramatically since 1972 and if you look at the cost of Piggelin in SEK ( Figure 1, red line), the price has increased 16 times (from 0.5 to 8 SEK) since 1972. There can of course be several reasons for why Piggelin has become more expensive since 1972, such as the introduction of costly government regulations or that the producing company has decreased the size of the ice cream, which actually happened in 1995 when the size of a Piggelin ice cream was decreased 11%, from 54 g to 48 g. However, Piggelin-loving internet activists in the early days of the internet united to protest, and since 1998 it is again 54 grams of ice cream on the wooden stick. You might think that it’s the company or the retailers that increase the price of Piggelin to increase their profits, but the interesting thing is that if you had paid your Piggelin with gold, the price would not have increased since 1972 (Figure 1, blue line)! On the contrary, you got twice as much Piggelin per gram of gold in 2010 compared to 1972! The price of Piggelin has not become more expensive since 1972 because the producer wants to increase its profit margin on Piggelin, but instead because the value of the Swedish krona has been reduced to a sixteenth in only 40 years! In addition, a more cost efficient production of Piggelin might have mitigated the increase in the Piggelin price, as measured in SEK, so the decrease in the value of the Swedish krona can actually be even more! Figure 1. 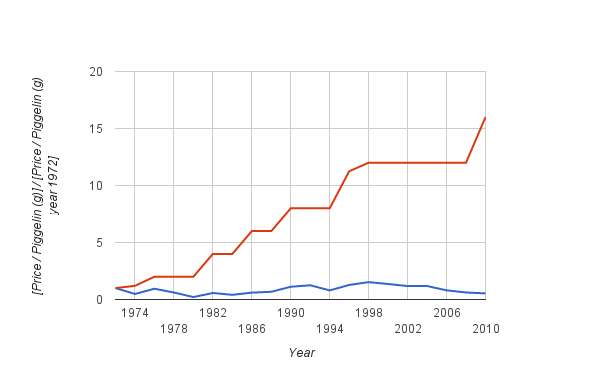 Change of price in SEK (red) and gold (blue) per gram Piggelin compared to the price of per gram Piggelin in 1972. So why do you need 16 times more SEK in 2010, but not more gold to buy a Piggelin? It is because of the inflation caused by the government and the central bank that creates lots of new money out of thin air that makes your 100 SEK earned in 1972 worth much less today. A blogger who has described the decline in value of today’s money really good is Martin Moraeus (farmer for real) and you can read his text here (in Swedish). So where does all this newly created money go? Most of it will come out on the state-regulated Swedish market when individuals and companies are taking loans and incurring debts to banks. The newly created money is therefore not really real money, but actually credits. Most people see these credits as money, which means that the credits are treated as if they were actual money. Most of these credits does not end up in every man’s checking account or wallet, but instead mainly in the housing and stock markets. Today, the inflation of the money supply, i.e. what makes your money decrease in value, is very large no matter what you hear in the mainstream media (you can read more about this in a previous post that you can find here). Money that can be created out of nothing is a terribly unjust economic system and I will explain in more detail why. People who can take a bank loan (those considered to be credit-worthy) can enjoy the benefits of the newly created money by purchasing goods and services before the prices are raised (because there is more money in the system). In a Swedish perspective, the people who can not afford (little or no income), do not get the opportunity (poor credit history), or are frugal and do not want to incur debt to banks, they only get to feel the negative impact when the value of their money is reduced by the increase of prices on goods and services when the total money supply increases. In a global perspective, most people in the world do not even have a bank account, and they have no ability to protect themselves against the value of their money continuously decreasing. So today’s currencies, which we use as a medium of exchange, is an incredibly corrupt and unjust system. This system especially harms the poorest in society, but also the people who are frugal and do not want to incur debt and participate in the loan carousel. So what are the alternatives? Physical mediums of exchange, such as gold, can not yet be created out of nothing as alchemists and scientists have not yet found a way to mass produce gold. You do not buy physical gold because you want to get rich from the value of gold rising in relation to dollar or SEK. Instead physical gold is primarily a safeguard against government manipulation and reduction of the value of money by “printing new money”, which you clearly can see in the Piggelin example above. Today, the global digital currency bitcoin is also a promising alternative. Bitcoin is protected by mathematical algorithms and can not be corrupted by politicians, central banks or other special interests. Bitcoin also has several other benefits and if you want to know more about bitcoin I recommend you read further on Pontus educational website about bitcoin. When individuals engage in barter with each other, both parties want the barter to be made with an honest medium of exchange. The price increase of the Piggelin ice cream clearly shows how much the value of the Swedish krona has eroded and how corrupt, dishonest and short sighted the current monetary system is (it is the same in every country in the world). Gold, other metals and bitcoin that have a limited supply can be seen as honest money and also as an antidote to today’s decline in value of the state-controlled currencies in the world.